The nomination deadline for the Celebrating Youth Awards has been extended to Friday May 18th at 12 pm. This is your chance to recognize an outstanding local youth for their contributions to the community in academics, athletics, volunteerism and more. Nomination forms are available online at the link below or at the Bobby Orr Hall of Fame in Parry Sound. Please note that all nominations must include the consent of a parent or guardian of the nominee. 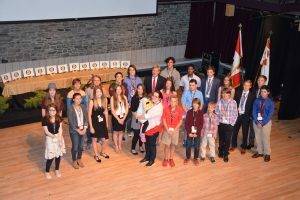 The Celebrating Youth Awards will be hosted by Bobby Orr on Saturday June 23, 2018. There will be no charge for tickets to this event sponsored by Mastercard and The Bobby Orr Hall of Fame. More information on tickets will be available at a later date. Plans are subject to change as nomination forms are received.